I am a beginner in R language and trying to make this picture. I tried radar. 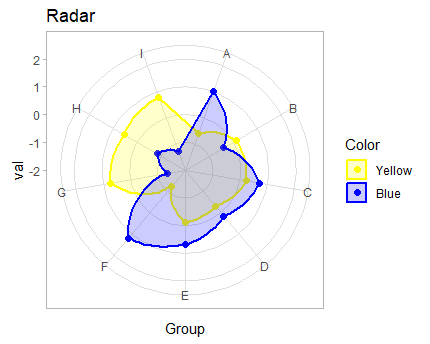 I tried using radarchart (radarchart(data)) but I do not know how to modify the picture. If your tag is meant for ggplot2 answers. In addition to its theme, some aesthetic parameters such as point size (geom_point(size=2)), line thickness (geom_polygon(size = 1)), color (scale_color_manual()) and filling color (scale_fill_manual()) could be useful to modify its look. Not the answer you're looking for? Browse other questions tagged ggplot2 radar or ask your own question.